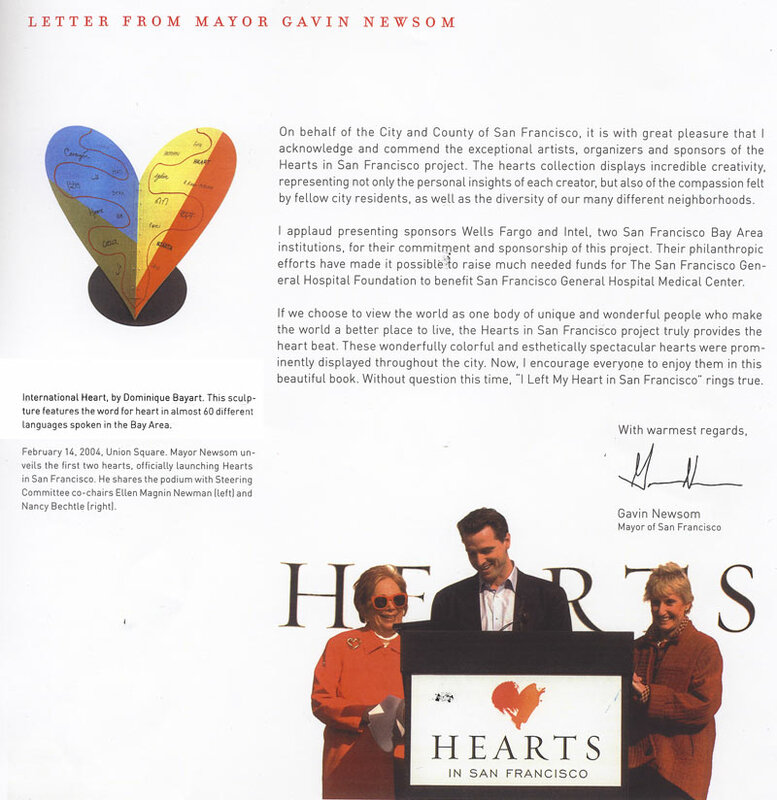 >> Letter From Mayor Cavin Newsom. Hearts in San Francisco. You may have wondered what those five-foot fiberglass hearts symbolized as you ventured through the financial district or took a stroll through Golden Gate Park. Appropriately making their debut on February 14, the hearts, inspired by the song, "I Left my Heart in San Francisco," emerged as part of the Hearts of San Francisco Project. 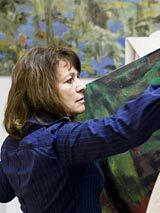 This project began as a fundraiser aimed at improving patient care at San Francisco General Hospital Medical Center (SFGHMC) as well as promoting artistic expression and tolerance. Inspired by Chicago's "Cows on Parade," Hearts in S.F. has 130 hearts scattered throughout the city that are as diverse in design and meaning as the city itself. However, the hearts aren't here to stay; they will be up for auction at the beginning of November. SFGHMC hopes to raise at least $1 million. Each heart carries a unique message. "Entangled Heart" is one of the many works on display. It is a red heart that appears to be caught in a giant copper mesh. The artist, Tor Archer, said his heart is a "representation of the web of love that entangles all of our hearts. It is meant to be a contemplative piece as one's eye traces the lines surrounding the heart." Walk towards the Wells Fargo Headquarters on Montgomery and California and you'll see a sparkling gold heart covered with brass coins. Created by Michael Osborne (designer of the LOVE stamp) and sponsored by Wells Fargo, this heart celebrates the California Gold Rush as well as commemorates Well's Fargo's 150 years of San Francisco banking history. If you want a language lesson, head over Fisherman's Wharf to find Dominique Bayart's heart, covered with 60 different ways to say "heart." Dominique's interpretation: "When we say HEART, we think about life and love: It is through the heart that we are physically connected to the world and emotionally connected to one another." SFGHMC is also home to a very special heart. Enveloped in shrubbery and topped with a tiny elf, this golden work was created by Lucy Puis, whose brother was saved at SFGHMC. No doubt, this piece reflects the heart of the project, to improve and provide compassionate patient care. Enjoy them while they last because they won't be here for long. Visitors and residents of San Francisco alike have until November 8th to take a peek at all the hearts before a select few (22) will be auctioned at the "Heart and Soul Dinner and Auction" on November 11. The auction is by invitation only, but those who are interested in purchasing a heart can bid in an online auction scheduled for November 4-14. Each heart is estimated at a whopping $7,000-$9,000. If you haven't had the chance to view all the hearts, head on over to the SBC parking lot from November 6-8 (9 a.m.-4 p.m.), where all 130 hearts will be on display for a heart extravaganza. There is a donation of $10 per adult for admittance (children 12 and under are free). Hearts in San Francisco is presented by Wells Fargo and the Intel Corporation. Leading sponsors also include VISA USA, and McKesson, Byer California, San Francisco Giants, and Macy's. SFGHMC has been a partner with UCSF for over 125 years and has training and research programs for Dentistry, Medicine, Nursing, and Pharmacy.